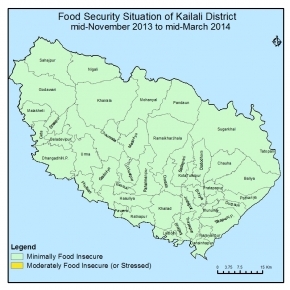 Overall the food security situation of the district is minimal food insecure during this reporting period,due to harvest of summer crops (Paddy & Maize) production increase by 15 % & decrease3.5% respectively compare to last year paddy production (Last year-203922 MT, This year- 234510 MT), Income through vegetables and cash crops during the review period (around 5,000 HHs) 6,00 commercial farmer directly involve in fresh vegetables and banana farming were average income @ NPR 18,000/HHs and 5,00 HHs earn 1 cor. 35 lakh @ NPR 36,000/HHs in banana farming HHshave food stock for more than 4 months from last harvest of summer crops and other sources, Normal market price of coarse rice compared to last year this cycle , Key markets have sufficient food stock due to regular supply, wage opportunities will be regular due different development activies ongoing from GOs and I/NGOs, People are using traditional coping mechanism by selling vegetable, cash crops and doing daily wage work. The overall situation is expected to be remain same in next cycle; Due to timely onset of winter rain production of winter crops (potato, mustsrd, cauli, cabbsge, tomato etc) is expected to be normal, HHs may depend on previous stock and market purchase, Food supply in market and transportation trails are expected to be regular, Continue support of Government and development agencies (main season for onset of government run projects and works)so, wage opportunities will benormal.